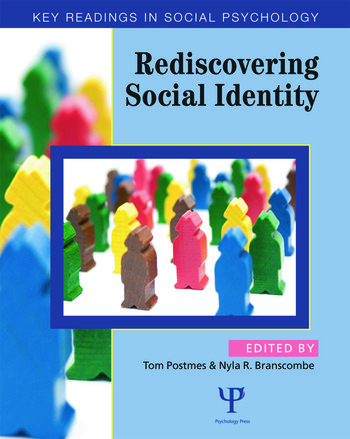 This reader brings together the founding texts of the "Social Identity Approach" - a set of concepts, ideas, and principles contained in Social Identity Theory and Self-Categorization Theory. This approach originated in social psychology and is increasingly part of the standard curriculum in communication and media studies, organizations and management, sociology, education, and politics. Originally published in the 1970s and 1980s by Henri Tajfel and John Turner, in a wide variety of books and journals, many of these articles have become citation classics, and for good reason: they have lost none of their inspirational quality. The depth and scope of their analysis is unrivalled, and there can be no doubt that the themes they address, such as intergroup conflict, diversity, stereotyping and social influence, are as relevant today as they ever were. Part 1. Introduction. T. Postmes, N.R. Branscombe, Sources of Social Identity. J.C. Turner, K.J. Reynolds, The Story of Social Identity. Part 2. Tajfel's Vision for a Social Psychology. H. Tajfel, Experiments in a Vacuum. H. Tajfel, Individuals and Groups in Social Psychology. Part 3. The Development of Social Identity Theory. H. Tajfel, Social Identity and Intergroup Behaviour. H. Tajfel, Interindividual Behaviour and Intergroup Behaviour. H. Tajfel, Social Categorization, Social Identity and Social Comparison. H. Tajfel, The Achievement of Group Differentiation. H. Tajfel, The Social Psychology of Minorities. H. Tajfel, J.C. Turner, An Integrative Theory of Intergroup Conflict. H. Tajfel, Social Stereotypes and Social Groups. Part 4. Conceptual and Meta-theoretical Foundations of Self-categorization Theory. J.C. Turner, Towards a Cognitive Redefinition of the Social Group. J.C. Turner, P.J. Oakes, The Significance of the Social Identity Concept for Social Psychology with Reference to Individualism, Interactionism and Social Influence. Part 5. Development and Elaboration of Self-categorization Theory. J.C. Turner, Social Categorization and the Self-Concept: A Social Cognitive Theory of Group Behavior. J.C. Turner, The Analysis of Social Influence. J.C. Turner, P.J. Oakes, S.A. Haslam, C. McGarty, Self and Collective: Cognition and Social Context. J.C. Turner, P.J. Oakes, The Socially Structured Mind. J.C. Turner, R.S. Onorato, Social Identity, Personality, and the Self-Concept: A Self-Categorization Perspective. Part 6. Conclusions. S.A. Haslam, N. Ellemers, S.D. Reicher, K.J. Reynolds, M.T. Schmitt, The Social Identity Perspective Today: The Impact of Its Defining Ideas. S.A. Haslam, N. Ellemers, S.D. Reicher, K.J. Reynolds, M.T. Schmitt, The Social Identity Perspective Tomorrow: Opportunities and Avenues for Advance. Tom Postmes (PhD, Amsterdam) is Professor of Social Psychology at the Universities of Groningen and of Exeter. His research is concerned with communication and group processes such as social influence, social identity formation, collective action, intergroup conflict, perceptions of discrimination and oppression. A large part of this research is concerned with the question of how such group processes operate in online groups and via Computer-Mediated Communication. He was awarded research fellowships by the Economic and Social Research Council, and an earlier fellowship award of the Royal Netherlands Academy of Arts and Sciences. Nyla R. Branscombe (PhD, Purdue) is Professor of Social Psychology at the University of Kansas. Her research addresses basic issues of Intergroup Relations from the perspectives of both disadvantaged and privileged groups. An important emphasis in her research has been the role of group history and its implications for emotional reactions to group-relevant outcomes in the present. Her research has benefited from the support of the Canadian Institute for Advanced Research—Social Interactions, Identity, and Well-Being Program.